The location-based game Pokémon Go has received a lot of attention, both in number of downloads and in media coverage. Earlier this year, the Forbes author JV Chamary listed why the game is the world's most important game. Two of the success factors, according to the author, are the facts that the game promotes physical activity and exploration of the nature. All ideas of location-based games presented in this blog post include both success factors. The Forbes author also listed social interaction, brain training and sunshine as reasons why the game is so essential. Consequently, there are many good motivations to create an interactive location-based game. In this blog post, we present four ideas of location-based games which you can easily build with Matchmore. For integration of location-based and proximity features with Matchmore, click here. Registration is of course free! Now, let the inspiration flow! One of the most spectacular urban man hunting games in recent times was the Mercedes-Benz Urban Hunting organized in Zürich in 2015. 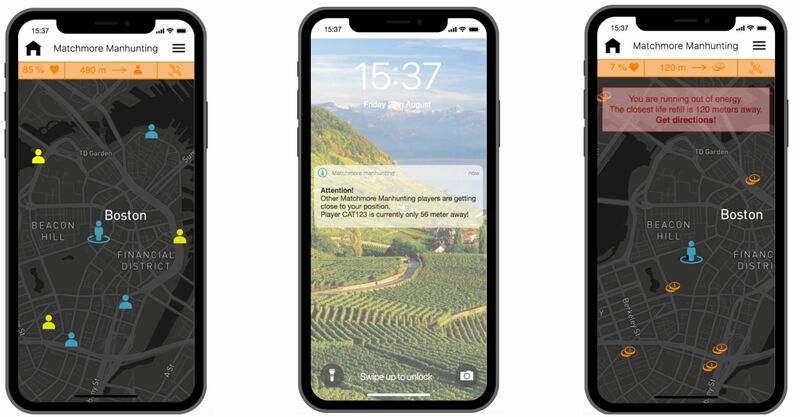 Participants were required to download an app, which kept track of their location and showed them where the predatory car was in real-time on a map. If the participants would get to close to the car, their energy level would run down. If the energy meter hit 0 %, the player was dead and out of the game. The last player standing actually won the chasing car after the game. What a game, huh?! In terms of location-based functionalities for a man hunting game, location and proximity are vital components. Thanks to the GPS, all players will be able to see their own location as well as the other players' location on a map. It's also possible to send out smart notifications to alert the players. So, whenever another player is approaching, the game will send smart warnings to the player - even if the game is only running in the background. Additionally, it will be possible to add other game features such as virtual checkpoints where players can earn extra energy or similar activities. Create a mobile treasure hunt where the treasures are based on real world locations. The treasures, real physical objects or virtual objects, can only be found through their GPS location. Two of the most popular world wide treasure hunting games are Pokémon Go and Geocaching. These games include, both virtual and physical objects. For a treasure hunt, there is nothing as important as a map. 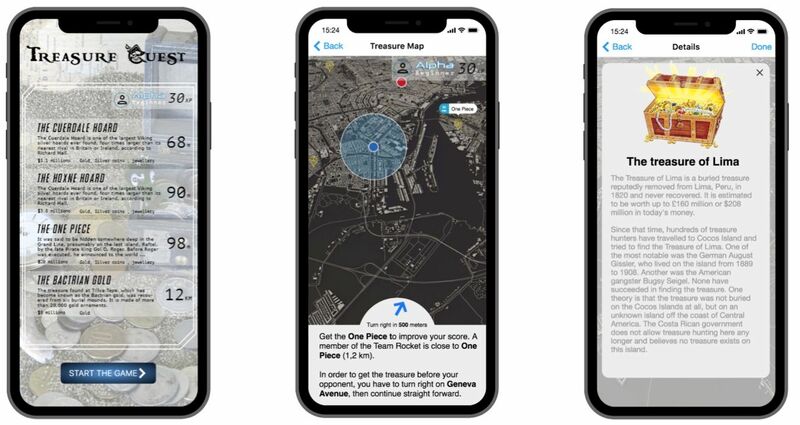 Players of a mobile treasure hunt game will be able to see a real-time map of their surroundings, as well as treasures (virtual or real physical objects) based on GPS. It will also be possible to view additional information of each treasure (object), as for example distance to the treasure, difficulty to gather the treasure and how much the treasure is worth. Players will be notified with smart notifications when they get close to treasures of value, even if the game is only running in the background. Creating these kind of apps with highly dynamic proximity detection features can be a complex process, and might drain your phone's battery rapidly due to the constant need of refreshing position. However, Matchmore takes care of all the complexity related to attaching context information to any connected object, tracking such objects in real-time relatively to each other, and finding and processing this information using best practice to save your batteries. Register and try our service for free! Follow a quiz walk in which the questions are found at particular GPS locations. Each player follows a specific route to discover the next question. This type of quiz works perfectly for smaller occasions as well as for larger events. The great advantage is that several teams can answer the same question at the same time, so there is no risk of queuing. 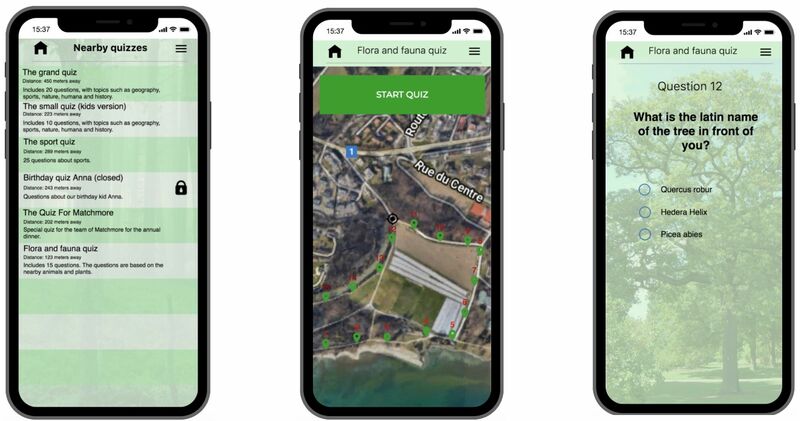 The participants of the discovery walk will be able to see all nearby quizzes and the distance to the start of each quiz. When the participants have chosen a quiz to follow, they will receive an overview of the quiz and the location of each question. The organizer will be able to create virtual questions at GPS locations. The questions can be related to the surroundings, like the example above with the latin name of the tree. Or, the question can be based on a completely different topic. A lot of you probably played capture the flag during your PE hours in school. It's a traditional outdoor game where two teams each have a flag and the objective is to capture the other team's flag and bring it safely back to their own base. The flag is located at the team's base, and the game requires a smart strategy in order not to get caught. The traditional game is usually played on an outdoor playground such as a football field. But, thanks to GPS features, it's possible to play capture the flag on a lot bigger field. The game can be extended to areas big as neighbor hoods, or even cities. 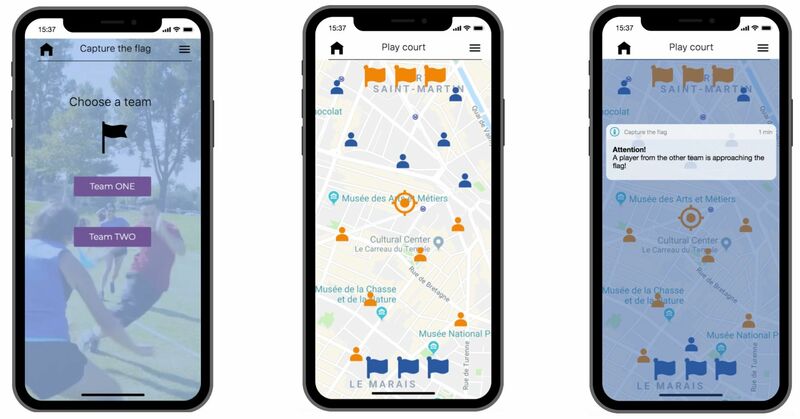 Instead of keeping track of the other team by just watching the other end of the court, the players now have to keep track on their opponents through their real-time locations on their mobile devices. Players of the mobile version of capture the flag will be able to choose which team to join as a start of the game. After the selection of team, the player will receive an overview of the playground and its borders. The overview, a map, will also show all players' real-time location based on GPS. When other players approach, either towards the flag or the player itself, the player will receive a smart alert based on proximity. Are you interested in integrating any of these functionalities to your app? Or, you don't have an app, but like the idea? Anyhow, we are more than happy to help you! Please feel free to contact us through our contact form, or send me a direct email at sofia.bjorklov@matchmore.com!